THE DETAILS This project’s compact courtyard area between the main house and guest house created challenging space restrictions. 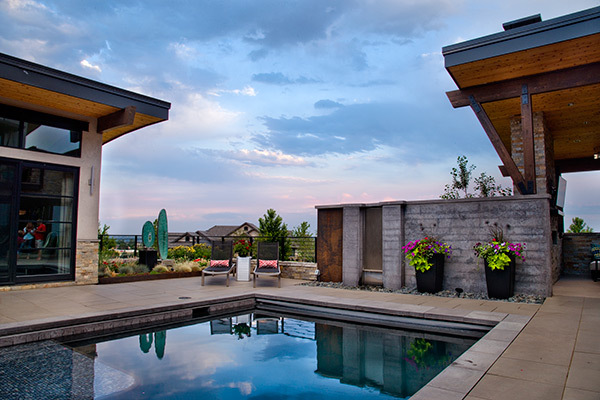 The area had to connect the two buildings and also have a pool, fire pit area, spa, outdoor kitchen, dining and living room to accommodate large gatherings. 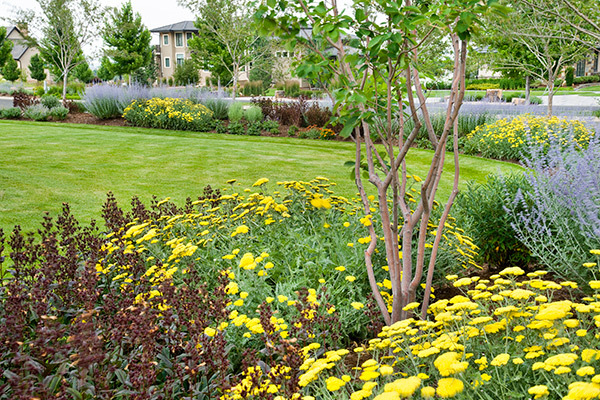 Various trails and paths lead guests around the property alongside beds incorporating ice plant, veronica and lambsear. 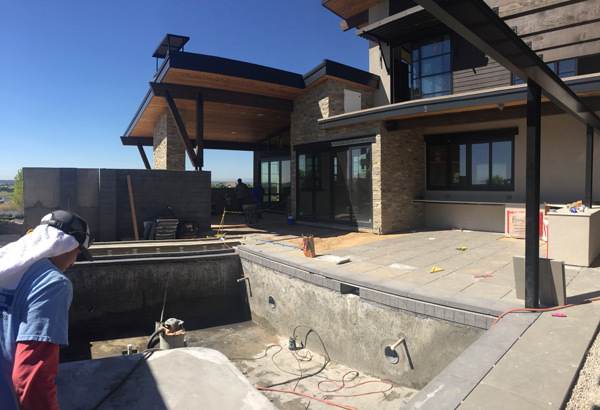 The property had a large area needing turf, but water conservation and maintenance demands were a concern, so the contractor incorporated irrigation supplies from Rain Bird Corp. 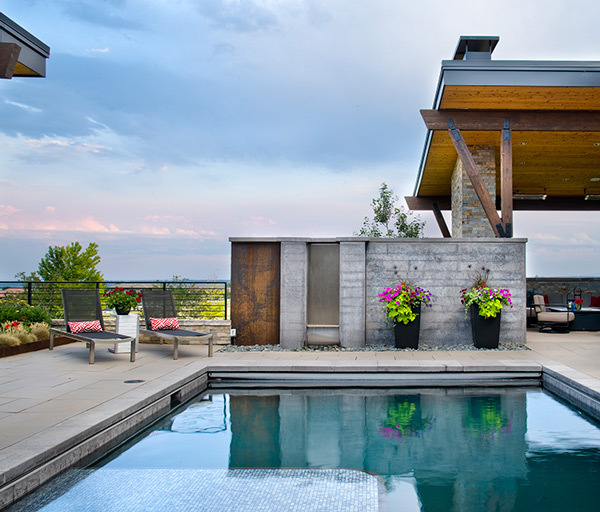 The courtyard’s design elements created privacy without blocking views of Colorado’s Front Range. The pool is surrounded by 0.75-inch Mirage Porcelain Pavers from Belgard and custom cast-gray coping. The courtyard is raised 10 feet from street level, which made installation of the project’s custom elements challenging. 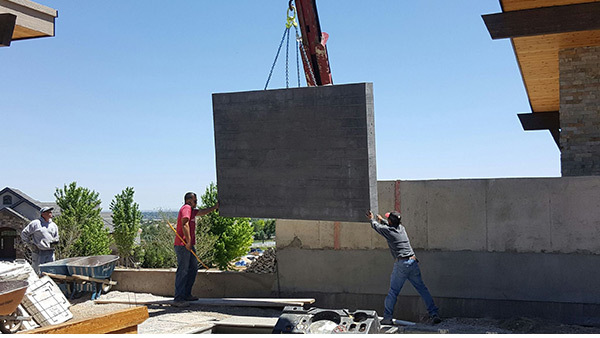 Lifescape Colorado used cranes to place larger elements — including the 15-by-6-foot concrete wall that was cast off-site — into the courtyard. Other elements of the project were installed with a Caterpillar skid-steer, a John Deere mini excavator and walk-behind Toro Dingos. 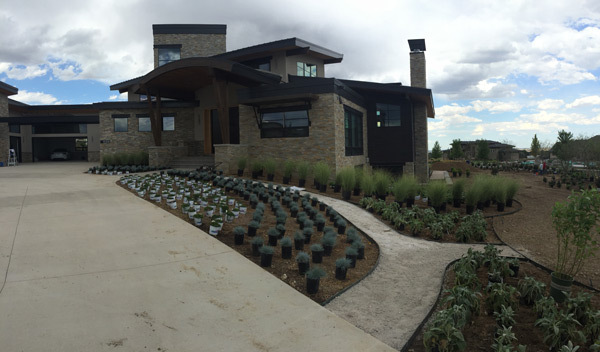 This project earned Lifescape Colorado a 2018 Silver Award from the National Association of Landscape Professionals’ Awards of Excellence program. 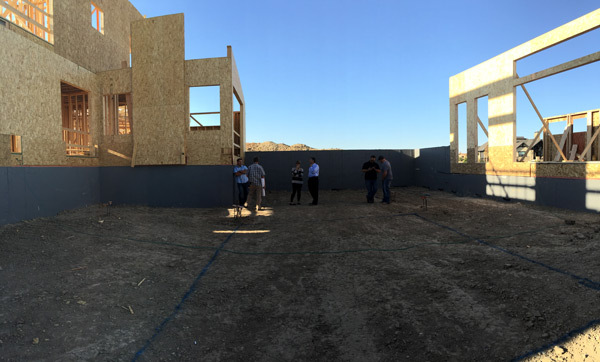 Construction in progress with extensive land area around the home. The beginning phases before any landscape elements were installed. 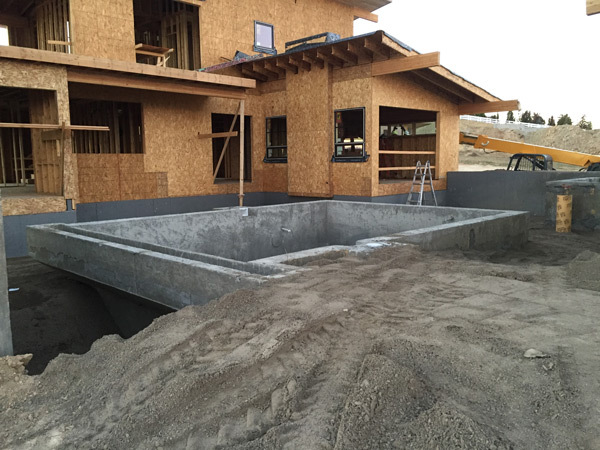 A before image of the courtyard with the pool in progress. A unique pergola joins the main house to the guest house. 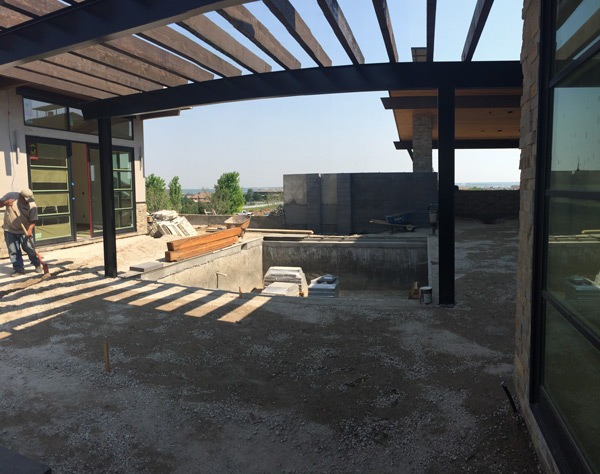 Lifescape Colorado’s team designed, built and acted as general contractor for the entire courtyard area and the surrounding property. One of the greatest challenges was how to fit the client’s diverse wish list of activity areas in the limited space between the main house and a guest house. 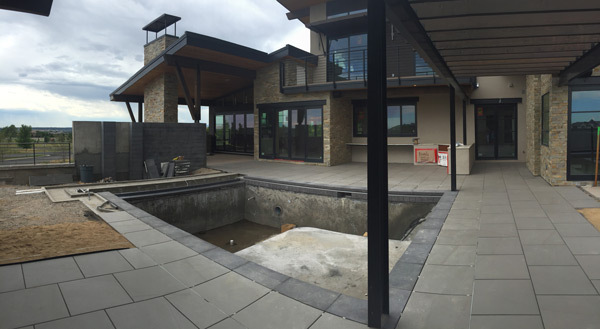 The pool is surrounded by three-quarter inch grey porcelain pavers and custom cast grey coping. The client’s desire for the property around the home, courtyard and guest house was a landscape that would complement the modern style of the home with color, texture and design. A large sunning shelf in pool is combined with enough depth in pool for play. Installation of the planting beds included a ribboning effect with lush detail at the entrance of the home. 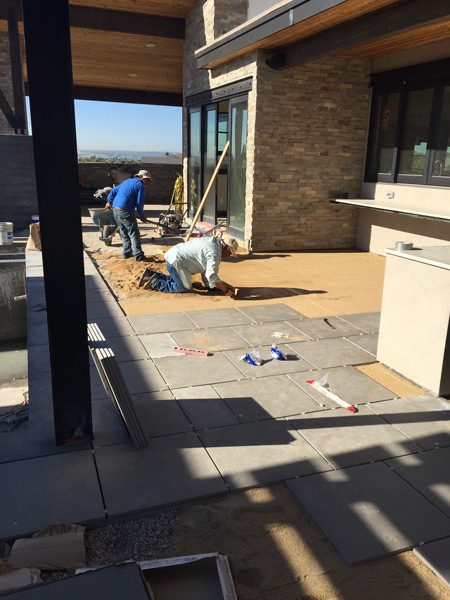 The highly exposed corner lot required privacy that needed to be created while still allowing views of Colorado’s Front Range and the mountains beyond. 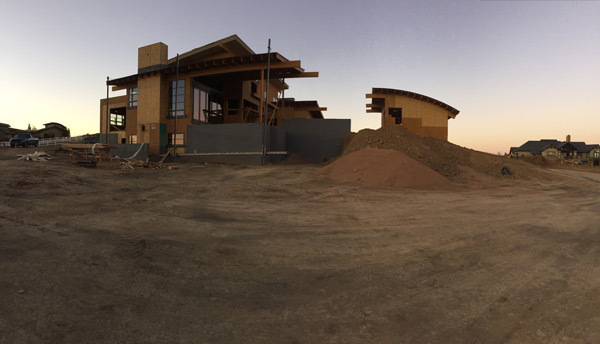 The front landscape was designed to complement the home’s contemporary style of architecture. 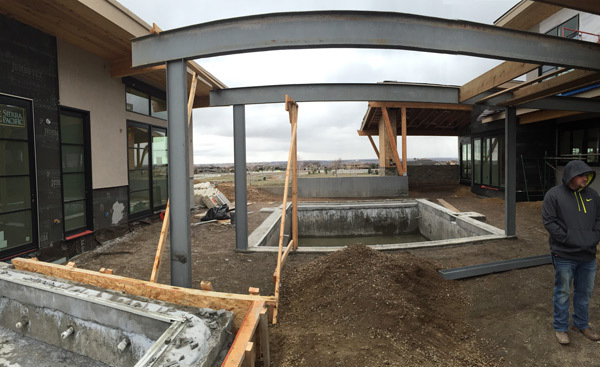 Craning the steel wall into place for the custom water feature. 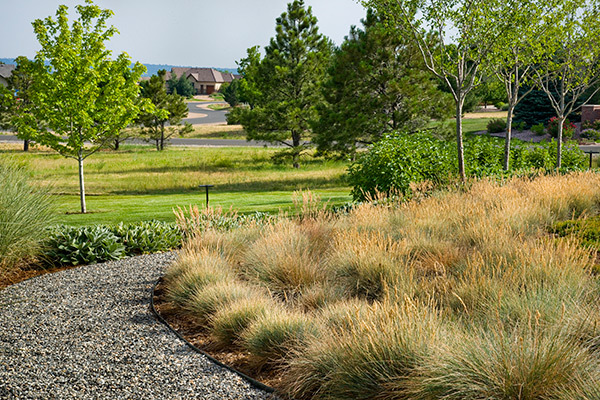 Grasses and contemporary pathways add interest along the massive wall that anchors the courtyard area. The path designed around edge of home leads to a stairway up to the pool and courtyard area. 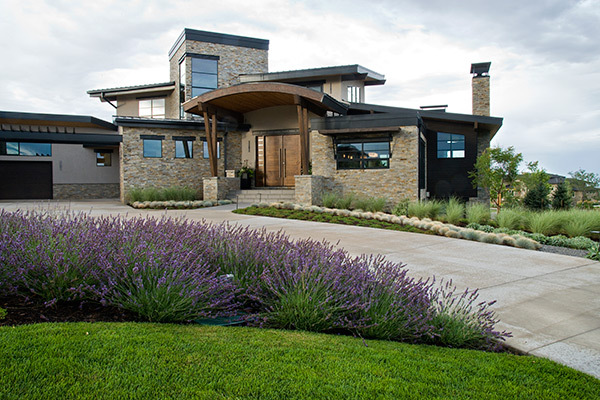 Color and texture were created throughout the landscape along paths and trails that surround the home. A trail leading from perimeter of property to main house.